A few weeks ago, the Museum hosted a fun day in partnership with another attraction, Exploration Place. Because I'm the Education Director (aka Curator of Fun Stuff), I put together the activities for this fun Dinosaur-themed day. So this idea is so creative - my mom took control of this one. She made "amber" eggs out of orange Jello. The Jello was placed into plastic Easter eggs and as it began to set, a "fossil" was put inside of it. She put in gummy butterflies or dinosaurs. We had a real piece of amber with an insect in it from the collection to help explain to kids what they were looking at. They were able to eat the amber egg and learn at the same time! 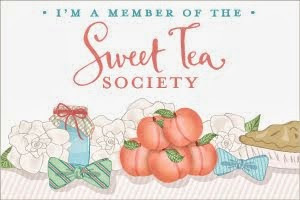 Supplies needed: Jello, Easter eggs, gummies, spoons, plates, wet wipes, egg cartons. For kids who need a sensory break or really just love dino toys, we had an arsenal of dinosaur toys out. A great place to find accurate representations of dinos is Safari. We just put ours out on a table and the kids had fun. Supplies needed: Dino toys. The MOST popular activity we have at the Museum is our fossil sediment station. Anytime we have it out on the floor, people line up to participate. This has a threefold reason: First, it's unexpected. Second, it's challenging. Third, you get to take home anything you find. In this bucket of what looks like dirt, people have found shark teeth, sea shells, sea urchin spines, sting ray plates, barnacles, and more! This stuff is fossil sediment from the Carolinas, distributed by the PotashCorp, a phosphate company. The sediment is available at no charge (really!). You have to send them an email with an education url and education mailing address for them to send you a huge bucket of sediment. For more info, email me. They even ship free! We have the guests put anything they want in a Ziploc bag and write their name on it. The easiest way to have them look through it is to put a small scoop onto a paper plate and use a pencil and magnifying glass to search through it. One bucket of sediment lasted us a year with around 8,000 school kids digging through it. Supplies needed: Fossil sediment, Ziploc bags, Sharpies to write names on bag, paper plates, pencils, magnifying glasses. Isn't our volunteer adorable here? She's helping guests measure dinos with life-size rope and paper foot drawings. The rope is measured from head-to-tail for dinos. Sizes of dinos are found all over the web. We used Triceratops (32 feet long), Velociraptor (5.9 feet long), Stegosaurus (23 feet long), and Brachiosaurus (100 feet long). Just measure out the correct number of feet with your rope and cut. We labeled them with pictures of the dinos so the kids could know what they were looking at. The feet were a little trickier to get life-size. I used a projector and my laptop and marked them out on a huge piece of paper first - then I made sure the projected foot lined up with my paper markings and finished drawing them. Comparing feet was fun for the guests, but the best thing was seeing them unravel the 100ft. Brachiosaur that spread the entire length of our building! We had to use a bucket to keep it from getting tangled. Supplies needed: Long rope, scissors, dino lengths. For footprints: Big paper, markers, dino measurements. Guests testing out how long the Brachiosaur was with rope! Our paleontologist examining his recent finds - note his sweet outfit! A more challenging station for guests was the fossil skeleton station, where we used pasta and printable dino skeletons to create fossil replicas. This was fun and made a neat take-home craft. The kids simply line up the pasta with the bone outlines to make the skeleton complete. It's a pre-cursor to what paleontologists who prepare skeletons do and a nice sensory activity. This one can take the kids awhile though, so be prepared to have some sit for awhile! We used spaghetti, rotini, macaroni, colored craft pasta, and bowtie pasta. Supplies needed: Printable dino skeletons, Elmers glue, macaroni, toothpicks or pencils to help the kids move the noodles, a place to let things dry. Well, hope you enjoyed this little snippet of Dino Days! We look forward to doing another activity like this soon. Fireworks are bursting outside my window. Whiz, pop, laughter. Any neighborhood sounds like that on July 4th. Unfortunately, when I ask the kids at the museum where I work what we celebrate on July 4th, they say "Firework Day!" I have always been intrigued with the question "Why?" I asked it all the time when I was small - why do we do this? Why is this the way it is? Why are we celebrating these things? Most of my teachers and professors could not answer those questions for me. My trigonometry teacher would get particularly frustrated with me when I asked him WHY do we use these rules in math and WHO invented them and HOW LONG have people been doing this stuff? I learned the answers to my questions in history class. So often, parents are celebrating our rich heritage with only the traditions and not the meaning behind them. The fourth of July, Thanksgiving, Christmas...all of these holidays are important culturally, but we often forget why we celebrate them in the first place. Things like mistakes! 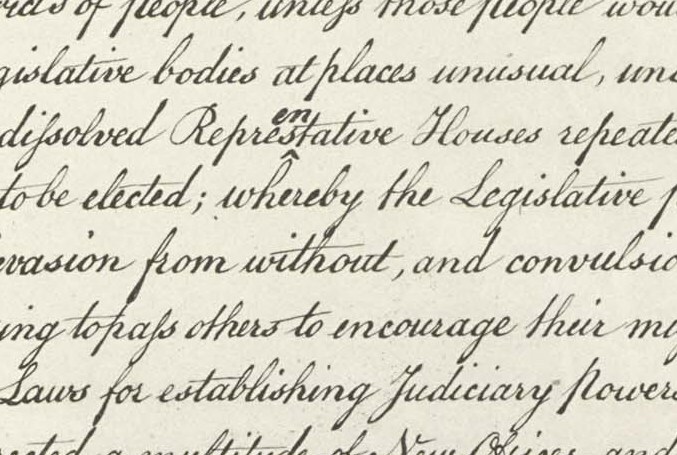 Even the founding document of our country is imperfect. Notice the word Representative was originally spelled wrong...they went back to fix it later! They left out the word "only" here and added it later. 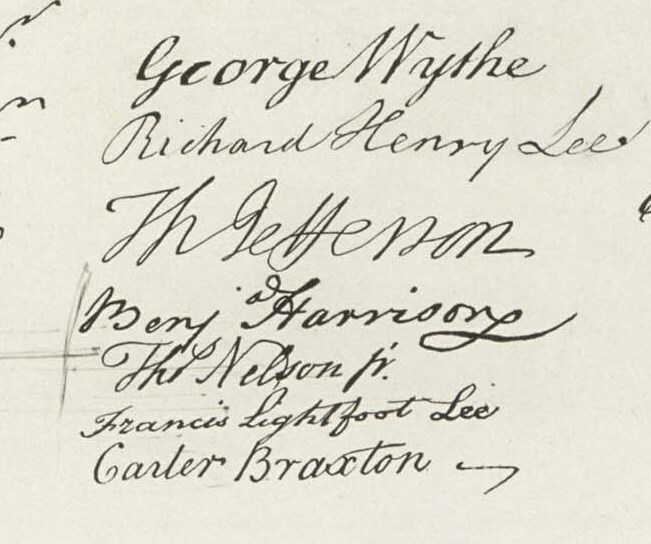 Even though we know Thomas Jefferson drafted the Declaration, his sloppy signature reveals he did not pen the document itself. 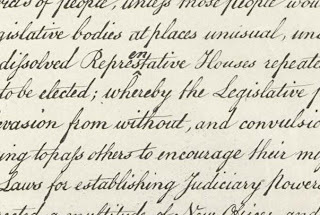 We believe a famous calligrapher, Timothy Matlack, actually did the writing. Funny, but we actually celebrate Independence Day two days late. We formally declared independence on July 2, 1776. John Adams wrote: July 2nd "the most memorable epocha in the history of America." Oops. 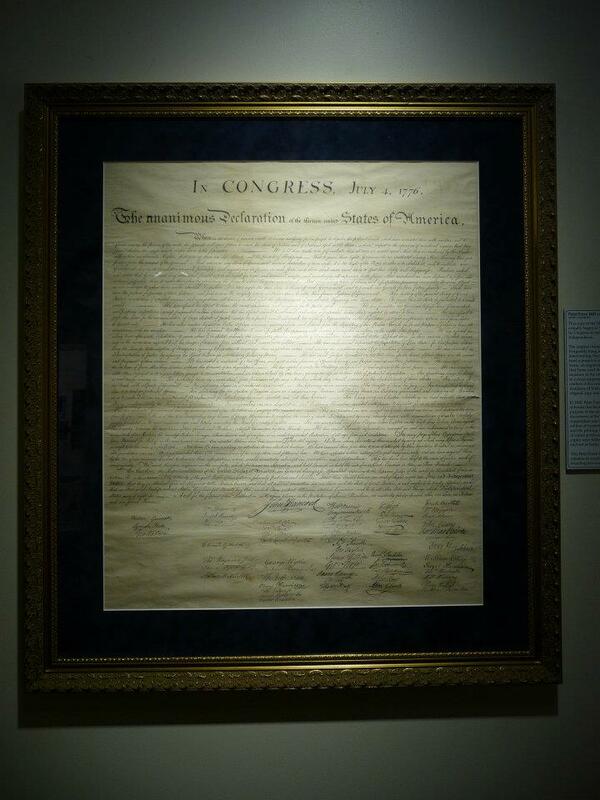 We celebrate it on July 4 because Congress approved the Declaration itself on that day. 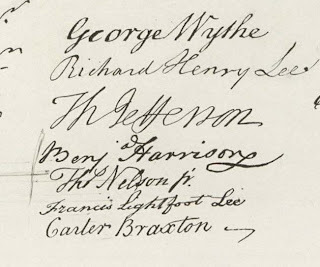 While some signed on August 2nd, 1776, at the formal signing meeting, a few signatures were added much later. 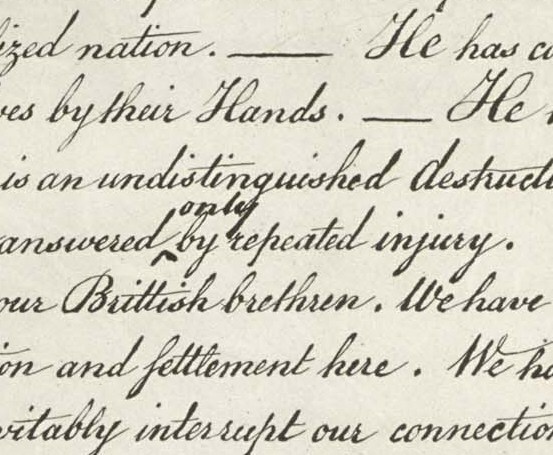 We believe the last signer, Thomas McKean, didn't sign until 1781. I always tell kids on field trips how important this document is. I also make it clear to them that the fourth is not just about fireworks and barbecue. 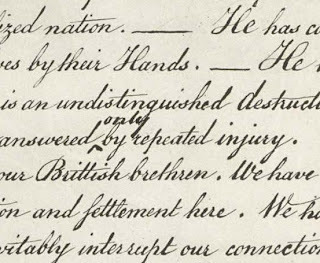 The 56 delegates who signed this document risked their lives for us - in fact, several of them had their homes ransacked and some were captured by the British. Encourage your family to celebrate our Independence for the right reasons - to commemorate those who lost their lives making our country independent, to remind ourselves of our uncertain beginnings, and to reiterate the fact that freedom always comes with a price. Enjoy Independence Day and remember America's fight to be free.